Cleveland Browns cornerback Terrance Mitchell (39) celebrates after a turnover by the New Orleans Saints during the second quarter at the Mercedes-Benz Superdome in New Orleans. 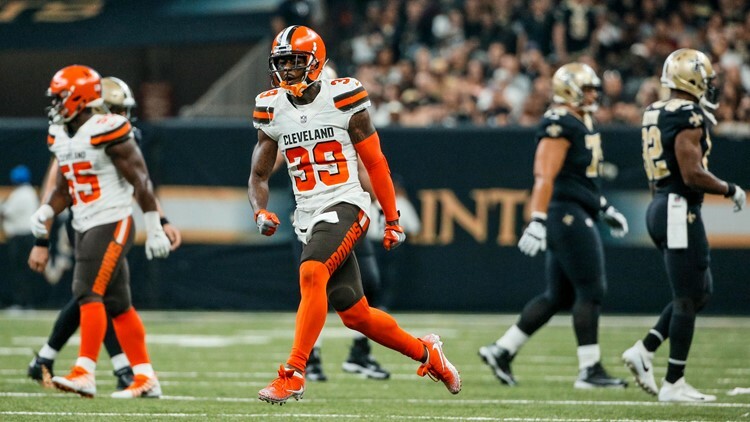 Cornerback Terrance Mitchell says "it feels cool" to be back with the Cleveland Browns after being activated from injured reserve. CLEVELAND -- It was a bad news, good news type of day for the Cleveland Browns when it came to the injury front Wednesday. 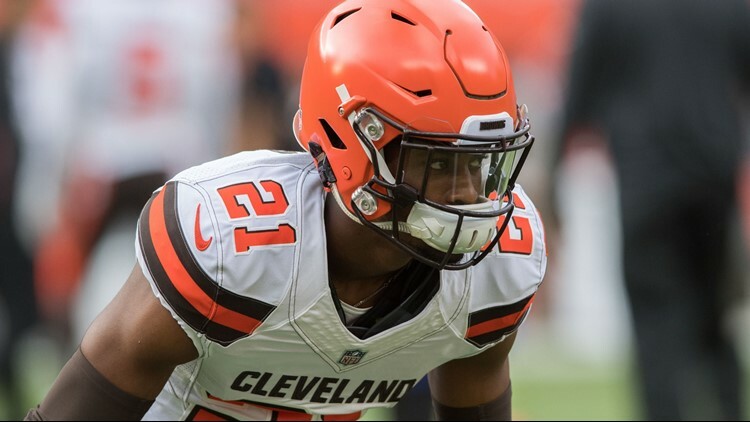 While fellow defensive back Denzel Ward remained in the NFL Concussion Protocol and may not be cleared in time for Sunday’s game against the Carolina Panthers at FirstEnergy Stadium in Cleveland, cornerback Terrance Mitchell returned from the broken arm he suffered in a Week 4 loss at the Oakland Raiders. “It feels cool,” Mitchell said. “I am just trying to do my best. Cleveland Browns defensive back Terrance Mitchell (39) warms up prior to a game against the Pittsburgh Steelers at FirstEnergy Stadium in Cleveland. In the first four games of the season with the Browns, Mitchell registered 19 total tackles, including 18 solo stops and one assist and defended three passes. Mitchell seemed especially adept at forcing turnovers, as he intercepted one pass and was among the league leaders with two forced fumbles and one recovery. “He is taking the next step,” interim coach Gregg Williams said of Mitchell. “We will see how it goes day by day by day. It is one of those things where it is hard for people to understand this, but you just do not want people to be out that long, and then, just all of a sudden, think you can step back in. Cleveland Browns defensive back Terrance Mitchel returns an interception in a drill during the final day of training camp in Berea Tuesday. Mitchell’s return comes at a time when the secondary is ailing. Along with Ward’s concussion concerns, Damarious Randall has been playing through a groin issue that forced him out of an early-November loss to the Kansas City Chiefs. “Denzel’s done a great job this year of being kind of a lockdown corner on the edge,” linebacker Joe Schobert said. “When the other team’s No. 1 receiver has lined up across from him, he’s done a good job of neutralizing, or at least containing, that threat. According to fellow defensive back T.J. Carrie, Mitchell’s return “is really important” not only to the secondary, but the entire defense. “T-Mitch has been very productive in the games that he has been here and the games he has played in,” Carrie said. “A very highly talented guy. He knows the game. He has played for a while. It is always good to get another dominant cornerback out there.